Here is a piece from the reconstruction era in Louisiana. 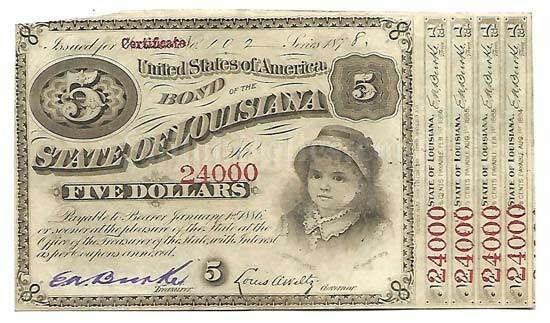 This $5 bond was issued in an attempt to stabilize the economy in the state of Louisiana after the state was almost bankrupted by the uncontrolled spending of its carpetbag government directly after the Civil War. These are often referred to as "Baby Bonds” because of the image of the young girl in the lower right hand corner. This one is in very fine condition and it has the stamped serial number as well, as the stamped certificate number. On the right-hand side, it still retains 4 of the original interest coupons. 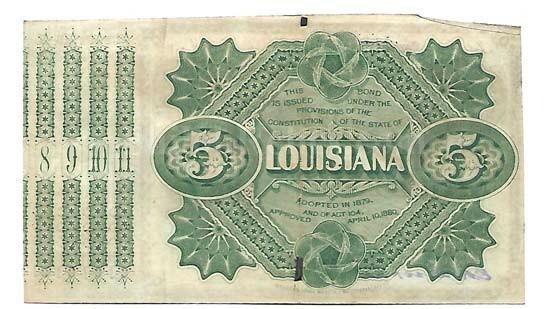 This is an interesting and very affordable piece from the reconstruction timeframe of the state of Louisiana.